Cake Byte: New Pin Design for Sale! 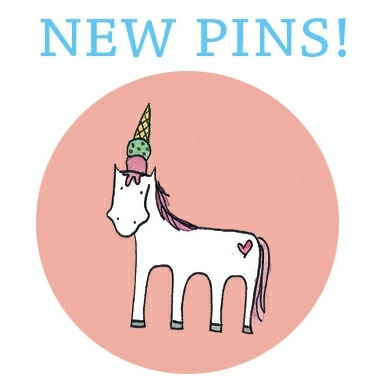 Here's a sweet little bit of news: there's a new pin design for sale in the CakeSpy online shop! I created this pin for one of my wholesale accounts, Salt & Straw Ice Cream in Portland, OR; but you, two, can buy into the magic, even if you don't live in Portland! You can buy the pins online here. Of course, I'd be remiss if I didn't remind you that there are also some other great products in the store (including my book, although you could also enter to win a copy here), and through tomorrow, all orders over $25 will ship for free if you use the code AWESOME12 ! Once again: shop online here. 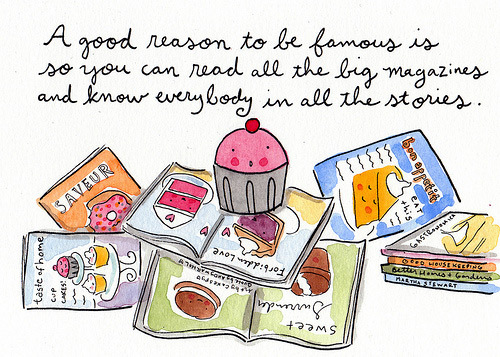 Probably, you already know all about the total awesome sweetness that is the CakeSpy online store. But in case you are unaware, I'd like to introduce you to some of the finest holiday items online! First off, adorable holiday cupcake magnets (pictured above). What a wonderful stocking stuffer! Oh, and by the way, if you wanted to customize your mix, just place an order then send me an email--I am happy to accommodate your request. Now. You probably also need to buy all of your friends and family members a copy of my book, too. 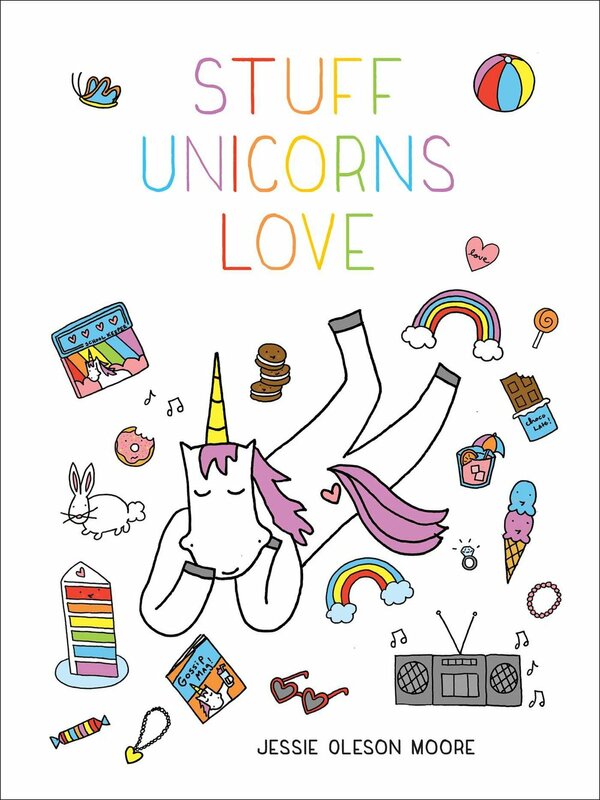 My online store is the only place to buy personalized signed copies--I will draw a unicorn in every copy, and write a sweet message just for you or the recipient! 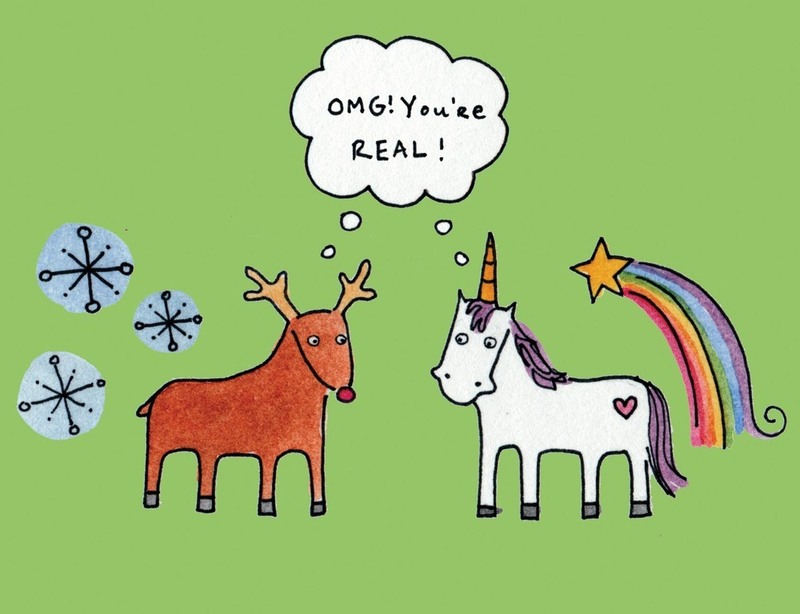 And also, you have never before seen an online store that has a mug featuring a unicorn and robot eating a banana and banana cream pie, respectively. Or if you have...I'll eat my hat! And, not to show off, but there are plenty of other awesome things in the store, too. And--OMG--I'm offering FREE SHIPPING on all orders over $25 through the end of this holiday weekend! Simply use code AWESOME12 to take advantage of this offer. Shop online here. So, recently I was approached by Red Envelope, asking if I'd like to test out some of their holiday wares for consideration on my site. They sent me a gift card and let me shop. Woohoo! First, the personalized red mug (pictured top). How cute is this, especially when personalized? I think mine looks rather fetching with the best book in the world (mine) and a cute cupcake from Sweet in Hoboken. My second choice was the personalized Jessie Steele apron. Since I am fairly petite, I got it in a child's size and had it personalized with "CakeSpy" (not sure if you can see the whole thing behind that magazine). I think I look rather adorable in it. They also have adult sizes, although those are not available for full personalization--just monograms. Overall, if you're looking for some sweet holiday gift ideas, Red Envelope is going to be a good bet, especially if your recipients love personalized stuff as much as I do. To shop, visit Red Envelope. 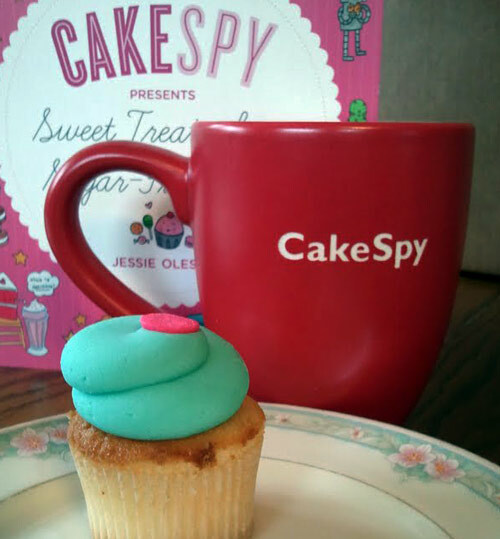 CakeSpy Official Book Launch on October 13 in Seattle! OK, sweeties. 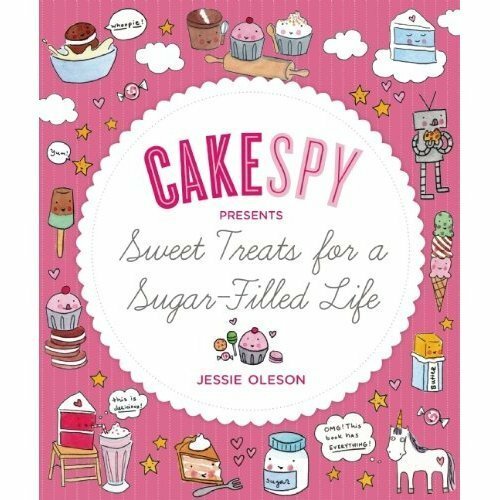 Consider this your official reminder: this Thursday is the Official CakeSpy Book Launch Party at CakeSpy Shop in Seattle! I will be there. My parents (from NJ) will be there. I will have books to sell you. And there will be cake. What to expect: an informal open-house type setting where we will have cake and treats (I will have 4-5 types of sweets made from recipes in the book! ), alcohol (woooo! ), original artwork as featured in the book on sale in the gallery, and my lovely little self on hand to sign the books which you should plan on buying. But wait, there's more! Because I hate being at an event and waiting for people to arrive fashionably late (don't make me wait all alone in my party dress, people! ), I would like to give you an incentive to come early: the first three guests will receive a FREE copy of the book!! That's right. You just mention this post and if you're one of the first three, you'll get the book at NO COST. And I will still sign it for you. For the rest of the tour dates, click here! To purchase the book in advance, visit cakespyshop.com or hit up Elliott Bay Books. Or win a copy here. So. If you didn't make it to the totally sweet Bake it in a Cake Bakesale last week at CakeSpy Shop, I feel very sorry for you. Because there were so many delicious treats and you didn't get to eat them! But, I do feel for you, really, I do. And so here's a little slideshow of some of the sweet treats--a little virtual snack for you, including pictures of brownies stuffed with oreos, cupcakes stuffed with mini pies, and more! See you at the next bake sale, sweeties! 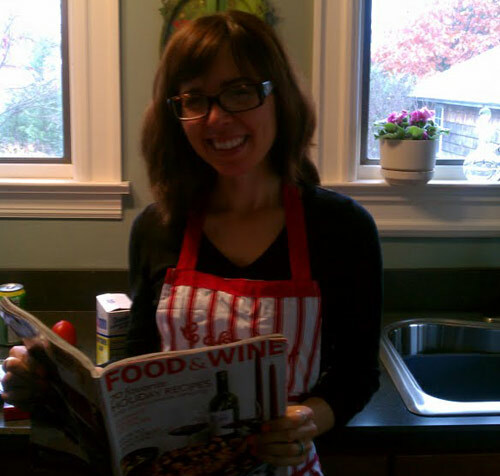 Keep up with Megan's work on the Bake it in a Cake website! 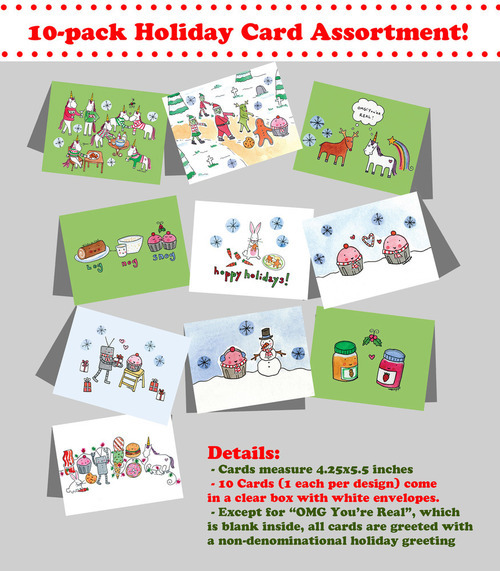 Here's a sweet sneak peek at one of the upcoming 2011 Holiday Card designs in the CakeSpy line! They will be available online in a week or two; in the meantime, I'll post a different sneak peek every few days. Pie Stand returns! This time, the famous pie-maker Kate Lebo is selling pies by the slice at CakeSpy, the sweetest space in Seattle. She'll have slices and hand pies for sale, including a couple fresh fruit and gluten free pies. Pay no attention to that "end at 4" time listed--she'll be open until she sells out (which she will! ), so come sooner rather than later. Kids and small dogs welcome. We'll also have her book of pie lore and poetry, A Commonplace Book of Pie, for sale at the shop. Kate's note: This is a good time to get your whole pie orders in, so let me know now if you'd like to take a whole pie home. Fresh slices are $3-5, whole frozen pies are $35 for one, $60 for two. Cash only for the pie, please! Details: Saturday, August 6 at CakeSpy Shop; 12pm Til we sell out. CakeSpy Shop is located at 415 E. Pine Street (at Summit) in Capitol Hill, Seattle; cakespyshop.com. Please note the shop is not a bakery, it's a space for people who love baked goods. See you there! We can't all have attractive feet. But no matter what your feet look like, you can coat them with a triple-threat of awesome with these brand-new CakeSpy Socks, created as a collaboration with the lovely and amazing Sock It To Me! 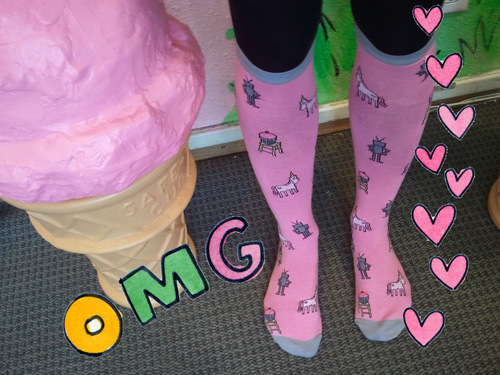 Covered with cupcakes, unicorns, and robots, these socks are aptly entitled "Trifecta", and they're like a treat...for your feet! Delightful and delicious...just not to eat. You can buy them online here, or come into the CakeSpy retail shop at 415 East Pine Street, where they are now available for purchase. Photos: Surber DesignsOne of the best parts about owning a store is having totally sweet, unexpected connections with customers. And recently, I had a really special one. It involved two cute girls who came into my store. They were visiting from out of town, and had made CakeSpy Shop a destination. Naturally, I already liked them. They were very taken by the store's decor, especially my jumbo ice cream cones. And this led to a conversation about ice cream, and I advised them that they should visit Bluebird Ice Cream, where I recently completed a mural. And I'm not sure how it exactly happened, but we all decided that they should take the ice cream cones with them. The only stipulations? "Be sure to bring them back, and promise that you'll send me the pictures," I said. Would they ever come back? I trusted they would. And they did, and they bought stuff (I told you I liked them! 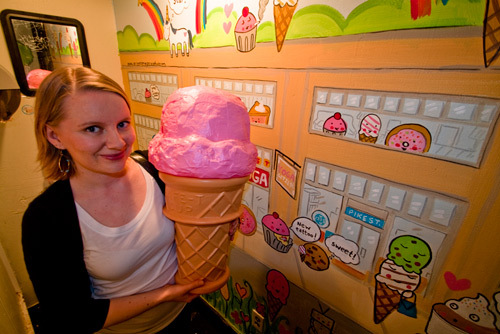 ), and they sent me the pictures of their great ice cream adventure. Here they are. Credit goes to Bethany Surber (Surber Designs) for the great photos, and to Kristen for being the cutest ice cream cone model ever. Twirling with an ice cream cone is a delight! Hello, Bluebird Ice Cream! 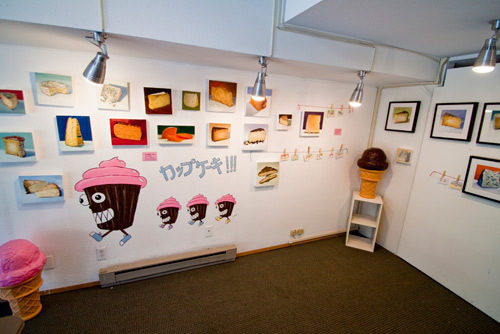 Hello, CakeSpy Mural! Hello, rest of mural!Thank you Bethany and Kristen for making my day a little sweeter! 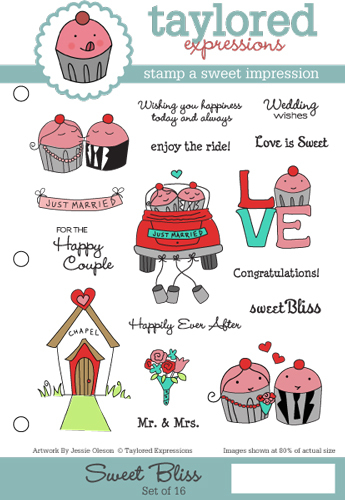 Cake Byte: New CakeSpy Wedding Stamps by Taylored Expressions! 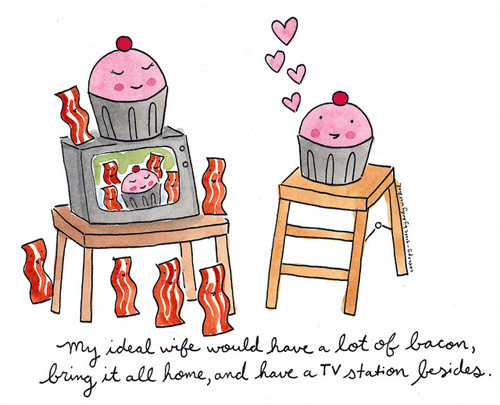 Like, totally sweet! It's time for a new batch of rubber stamps created by our own Head Spy Jessie in collaboration with Taylored Expressions! The newest set has a wedding theme, because everyone knows love is totally sweet. 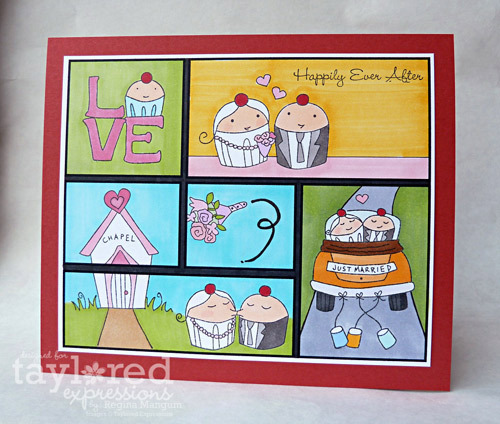 You can get ideas for projects like the card shown above, here; to buy the stamps, which retail for $21.95, visit tayloredexpressions.com! Buy these!It's time for some seriously coo-inducing cuteness: CakeSpy has done a new batch of designs for Taylored Expressions rubber stamps! This time, the theme is babycakes, and this sweet set of stamps features all sorts of new baby themes--in cupcake form, natch! These rubber stamps are perfect for choosing your own greeting card adventure or a variety of other crafts! They can be purchased on the Taylored Expressions website! CakeSpy Note: Here's the first in a series of Pie Slam Profiles, featuring the recipes and stories of each of the 9 entrants in last week's Pi(e) Day Pie Slam! 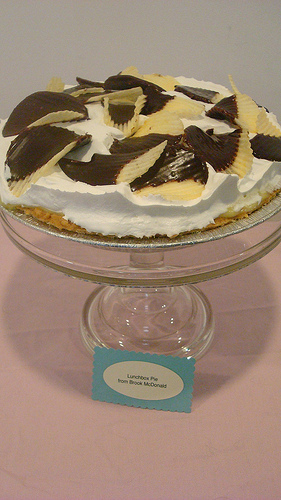 This entry, for a toothsome concoction of banana, honey, whipped cream, peanut butter, and chocolate covered potato chips(!) was made by Brook, a freshman at Seattle University, who is "getting a business degree so that I may open my own bakery one day, which is my greatest dream and passion." Especially her pies now that was no debate. With a sandwich so delicious she could not stop smacking her lips. And an idea that popped into her head that was just about to burst. This was to be the best pie ever, the greatest of them all! As she twirled and spun with the greatest of thrill. But the ruffles dipped in chocolate were the true greatness. At last her hard work was finished and she could not wait to eat! and here's the recipe. It's a monster, but it's worth it: this was a very, very delicious pie. SPRINKLE half the maximum recommended amount of ice-cold water over the flour mixture. Using a fork, stir and draw flour from bottom of bowl to the top, distributing moisture evenly into flour. Press chunks down to bottom of bowl with fork. Add more water by the tablespoon, until dough is moist enough to hold together when pressed together. Tip Test dough for proper moistness by squeezing a marble-sized ball of dough in your hand. If it holds together firmly, do not add any additional water. If the dough crumbles, add more water by the tablespoonful, until dough is moist enough to form a smooth ball when pressed together. SHAPE dough into a ball for single piecrust. Divide dough in two for double crust or double deep-dish crust, one ball slightly larger than the other. Flatten ball(s) into 1/2-inch thick round disk(s). ROLL from center outward with steady pressure on a lightly floured work surface (or between two sheets of wax or parchment paper) into a circle 2-inches wider than pie plate for the bottom crust. Transfer dough to pie plate by loosely rolling around rolling pin. Center the rolling pin over the pie plate, and then unroll, easing dough into pie plate. Tip For ease in rolling, wrap dough in plastic wrap. Chill for 30 minutes or up to 2 days. Thoroughly prick bottom and sides of unbaked pie dough with fork (50 times) to prevent it from blistering or rising. Bake crust in lower third of oven, at 425°F, 10-12 minutes or until edges and bottom are golden brown. Side of a 9 1/2 –inch deep-dish pie pan. I like to use Classic Crisco Pie Crust. Bake and let cool thoroughly before filling. Using a medium sized bowl and chilled beaters, whip the cream with an electric mixer until stiff but not grainy. Do not overbeat! Cover and refrigerate. In a large bowl cream the cream cheese and peanut butter with the mixer on medium speed until evenly blended. Gradually beat in the granulated sugar, then the brown sugar, until blended. The mixture may look lumpy, like cookie dough. That’s the way it is supposed to be, so don’t worry. Blend in the vanilla. Add the whipped cream, and slowly blending with the mixer until smooth. Clean and dry the beaters. Using a clean medium-sized bowl beat the egg whites until they hold stiff peaks. Fold them into the peanut butter mixture with a rubber spatula or gently beat them in with a mixer until evenly blended. Scrape the filling into the chilled pie shell until about ¾ full. Smooth with a spoon and cover loosely with aluminum foil and freeze until firm enough to slice cleanly but not rock solid, about 4 hours. While cooling, begin to cook the pudding and refrigerate until firm. Use a double broiler to melt one package of milk chocolate chips, dip ruffles according to your liking and place on a piece of wax paper to let cool, you may also refrigerate these if you choose. Combine the pudding with the bananas, you only need to coat them graciously with the pudding, but not completely submerge them, do this by continuously adding dollops of pudding to the bananas. Gently Spread banana mixture over the Peanut butter Pie, place in fridge. Gently mix one tablespoon honey to cool whip mixture until fluffy, spread over pie until covered, place chocolate covered potato chips over the top, and cool until served. For the full entry and recipe, visit Serious Eats! 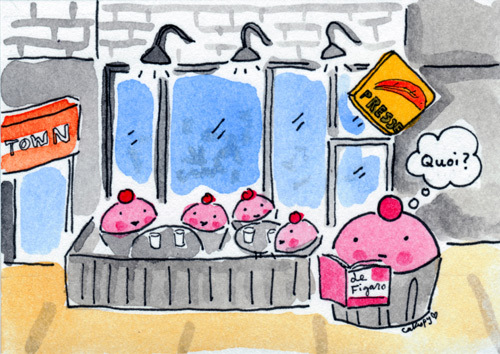 For more fun pie times, come to CakeSpy Shop tonight for Seattle's first PIE SLAM! Um, OMG. The two awesomest blogs on the internet (hey, modesty is not my strong suit) are teaming up for a super sweet bake sale at CakeSpy Shop! That's right. CakeSpy and Bake It In A Cake are having a bake sale on March 26! There will be dozens and dozens (and dozens!) 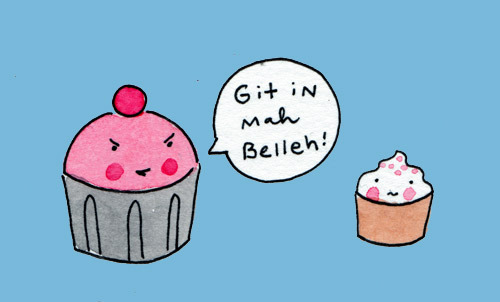 of cupcakes! Filled with delicious things! Available for your purchase (bring cash, sweeties!) and eating! At a shop full of adorable cards, art and gifts! What other information could you possibly need? Oh, ok, dates and times. Learn more about Bake It in a Cake here; shop for awesome art in advance at cakespyshop.com. Who inspires a spy? Andy Warhol, for sure. Although food-wise he's probably most closely associated with soup cans, the king of Pop (art, that is) was actually quite a sweet tooth: he's quoted as having said "All I ever really want is sugar", and was in the habit of ordering a big piece of manly meat at restaurants, only to discard it on the street and go home for the dinner he really wanted of toast with sweet jam. "I never fall apart because I never fall together" "My ideal wife would have a lot of bacon, bring it all home, and have a TV station besides"
"When I got my first TV set, I stopped caring so much about having close relationships with other people" "Sometimes something can look beautiful just because it's different in some way from the other things around it." Originals for sale at CakeSpy Shop. Cake Byte: This Charming Candy Lollipops Now Available at CakeSpy Shop! Can you say "Birthday Cake Lollipop"? Well, I'm sure you are capable of doing so, but wouldn't it be so much nicer to have your mouth full of delicious birthday cake lollipop? You're in luck: CakeSpy Shop, my new retail gallery and gift shop in Capitol Hill, Seattle, is the newest stockist for This Charming Candy lollipops! These locally handmade, small-batch artisan lollipops are in the shop and available in flavors like Vanilla-cardamom, Birthday Cake, and Salted Caramel! I'm selling them singly, and by the package. Looks like Capitol Hill just got sweeter! This Charming Candy Lollipops, now available at CakeSpy Shop + Bluebottle Art Gallery, 415 E Pine Street, Seattle WA 98122, open Tue-Sun 12-7 p.m.! 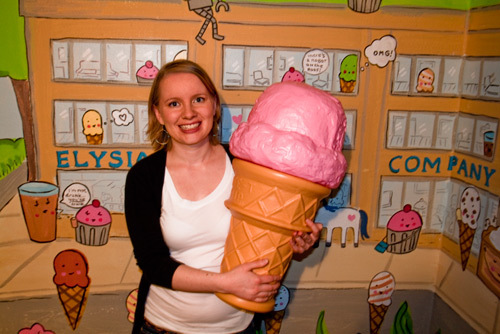 Cake Byte: CakeSpy Shop Grand Opening Party Tonight! What can I say other than you're gonna feel really bad if you miss this awesomeness? It's been given shout-outs by the Stranger, Joey Veltkamp, and Capitol Hill Seattle--just to name a few! 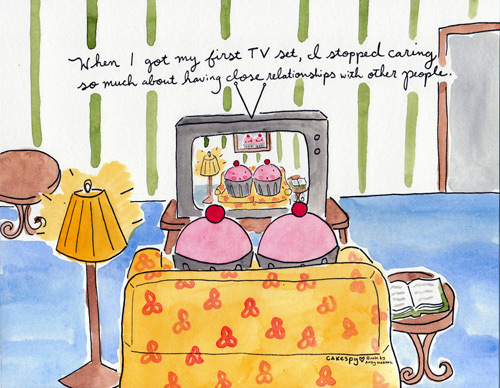 There will be many new Capitol Hill-themed paintings, and cupcakes from Trophy Cupcakes, too! Please, do drop by from 5-8 p.m.!